A managed object context is an in-memory scratchpad for working with your managed objects. Most apps need just a single managed object context. The default configuration in most Core Data apps is a single managed object context associated with the main queue. Multiple managed object contexts make your apps harder to debug; it’s not something you’d use in every app, in every situation. That being said, certain situations do warrant the use of more than one managed object context. For example, long-running tasks, such as exporting data, will block the main thread of apps that use only a single main-queue managed object context and cause the UI to stutter. In other situations, such as when edits are being made to user data, it’s helpful to treat a managed object context as a set of changes that the app can discard if it no longer needs them. Using child contexts makes this possible. In this tutorial, you’ll learn about multiple managed object contexts by taking a journaling app for surfers and improving it in several ways by adding multiple contexts. 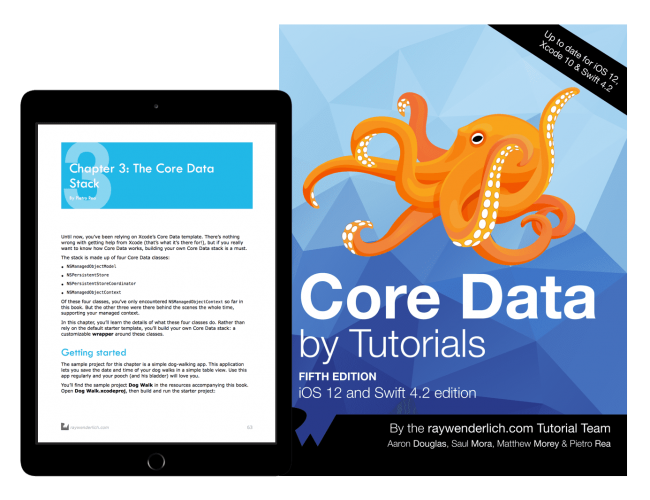 Note: This is an advanced tutorial, and assumes prior knowledge of Swift, Core Data, and iOS app development in general. If common Core Data phrases such as managed object subclass and persistent store coordinator don’t ring any bells, or if you’re unsure what a Core Data stack is supposed to do, you may want to read some of our other Core Data tutorials first. 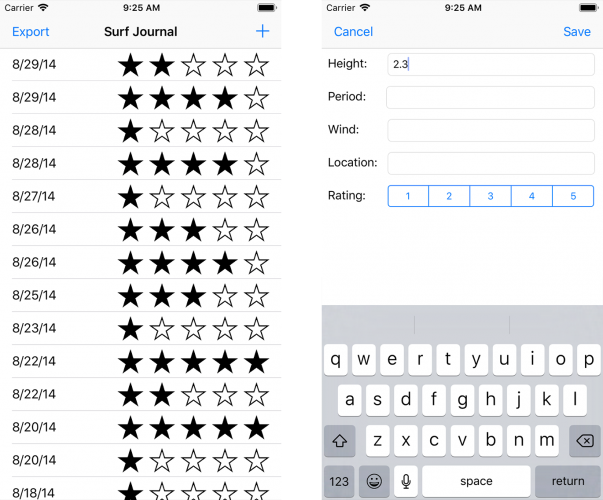 This tutorial’s starter project is a simple journal app for surfers. 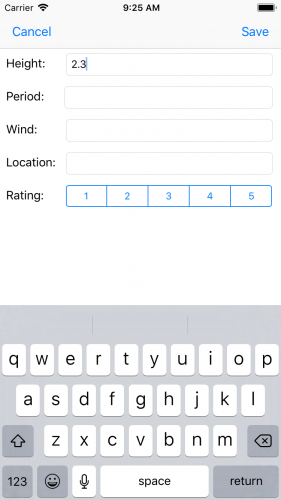 After each surf session, a surfer can use the app to create a new journal entry that records marine parameters, such as swell height or period, and rate the session from 1 to 5. Dude, if you’re not fond of hanging ten and getting barreled, no worries, brah. Just replace the surfing terminology with your favorite hobby of choice! Download the resources for this tutorial using the “Download materials” button at the top or bottom of this page. Find the SurfJournal starter project. Open the project, then build and run the app. 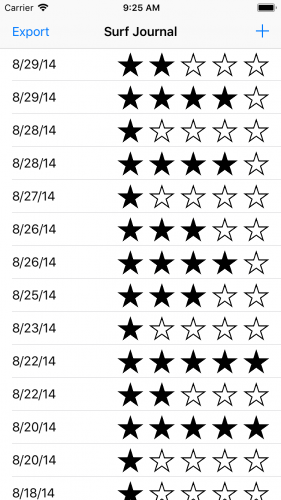 On startup, the application lists all previous surf session journal entries. Tapping a row brings up the detail view of a surf session with the ability to make edits. As you can see, the sample app works and has data. Tapping the Export button on the top-left exports the data to a comma-separated values (CSV) file. Tapping the plus (+) button on the top-right adds a new journal entry. Tapping a row in the list opens the entry in edit mode, where you can change or view the details of a surf session. Although the sample project appears simple, it actually does a lot and will serve as a good base to add multi-context support. First, let’s make sure you have a good understanding of the various classes in the project. Before jumping into the code, take a brief moment to go over what each class does for you out of the box. AppDelegate: On first launch, the app delegate creates the Core Data stack and sets the coreDataStack property on the primary view controller JournalListViewController. CoreDataStack: This object contains the cadre of Core Data objects known as the stack. This time the stack installs a database that already has data in it on first launch. No need to worry about this just yet; you’ll see how it works shortly. JournalListViewController: The sample project is a one-page, table-based application. This file represents that table. If you’re curious about its UI elements, head over to Main.storyboard. There’s a table view controller embedded in a navigation controller and a single prototype cell of type SurfEntryTableViewCell. JournalEntryViewController: This class handles creating and editing surf journal entries. You can see its UI in Main.storyboard. JournalEntry: This class represents a surf journal entry. It’s an NSManagedObject subclass with six properties for attributes: date, height, location, period, rating and wind. If you’re curious about this class’s entity definition, check out SurfJournalModel.xcdatamodel. JournalEntry+Helper: This is an extension to the JournalEntry object. It includes the CSV export method csv() and the stringForDate() helper method. These methods are implemented in the extension to avoid being destroyed when you make changes to the Core Data model. There was already a significant amount of data when you first launched the app. This sample project comes with a seeded Core Data database. You first check UserDefaults for the previouslyLaunched boolean value. If the current execution is indeed the app’s first launch, the Bool will be false, making the if statement true. On first launch, the first thing you do is set previouslyLaunched to true so the seeding operation never happens again. 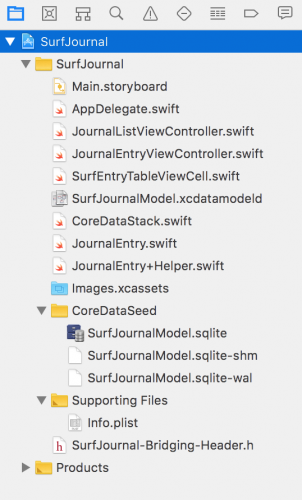 You then copy the SQLite seed file SurfJournalModel.sqlite, included with the app bundle, to the directory returned by the Core Data-provided method NSPersistentContainer.defaultDirectoryURL(). Once the copy of SurfJournalModel.sqlite has succeeded, you then copy over the support file SurfJournalModel.sqlite-shm. Finally, you copy over the remaining support file SurfJournalModel.sqlite-wal. The only reason SurfJournalModel.sqlite, SurfJournalModel.sqlite-shm or SurfJournalModel.sqlite-wal would fail to copy on first launch is if something really bad happened, such as disk corruption from cosmic radiation. In that case, the device, including any apps, would likely also fail. If the files fail to copy, there’s no point in continuing, so the catch blocks call fatalError. Note: Developers often frown upon using abort and fatalError, as it confuses users by causing the app to quit suddenly and without explanation. This is one scenario where fatalError is acceptable, since the app needs Core Data to work. If an app requires Core Data and Core Data isn’t working, there’s no point in letting the app continue on, only to fail sometime later in a non-deterministic way. Calling fatalError, at the very least, generates a stack trace, which can be helpful when trying to fix the problem. If your app has support for remote logging or crash reporting, you should log any relevant information that might be helpful for debugging before calling fatalError. To support concurrent reads and writes, the persistent SQLite store in this sample app uses SHM (shared memory file) and WAL (write-ahead logging) files. You don’t need to know how these extra files work, but you do need to be aware of their existence, and that you need to copy them over when seeding the database. 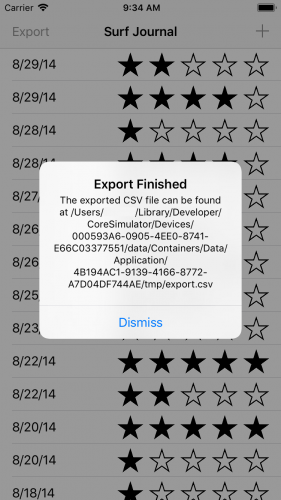 If you fail to copy over these files, the app will work, but it might be missing data. Now that you know something about beginning with a seeded database, you’ll learn about multiple managed object contexts by working on a temporary private context. If you haven’t done so already, tap the Export button at the top-left and then immediately try to scroll the list of surf session journal entries. Notice anything? The export operation takes several seconds, and it prevents the UI from responding to touch events such as scrolling. The UI is blocked during the export operation because both the export operation and UI are using the main queue to perform their work. This is the default behavior. The traditional way to fix this is to use Grand Central Dispatch to run the export operation on a background queue. However, Core Data managed object contexts are not thread-safe. That means you can’t just dispatch to a background queue and use the same Core Data stack. The solution is simple: use a private background queue rather than the main queue for the export operation. This will keep the main queue free for the UI to use. But before you jump in and fix the problem, you need to understand how the export operation works. let coalescedHeight = height ?? "" let coalescedPeriod = period ?? "" let coalescedWind = wind ?? "" let coalescedLocation = location ?? "" As you can see, JournalEntry returns a comma-separated string of the entity’s attributes. Because the JournalEntry attributes are allowed to be nil, the function uses the nil coalescing operator (??) to export an empty string instead of an unhelpful debug message that the attribute is nil. Note: The nil coalescing operator (??) unwraps an optional if it contains a value; otherwise it returns a default value. For example, the following: let coalescedHeight = height != nil ? height! : "" can be shortened using the nil coalescing operator to: let coalescedHeight = height ?? "". let exportFilePath = NSTemporaryDirectory() + "export.csv"
First, retrieve all JournalEntry entities by executing a fetch request. The fetch request is the same one used by the fetched results controller. Therefore, you reuse the surfJournalFetchRequest method to create the request to avoid duplication. Next, create the URL for the exported CSV file by appending the file name (“export.csv”) to the output of the NSTemporaryDirectory method. The path returned by NSTemporaryDirectory is a unique directory for temporary file storage. This a good place for files that can easily be generated again and don’t need to be backed up by iTunes or to iCloud. After creating the export URL, call createFile(atPath:contents:attributes:) to create the empty file where you’ll store the exported data. If a file already exists at the specified file path, this method will remove it first. First, the app needs to create a file handler for writing, which is simply an object that handles the low-level disk operations necessary for writing data. To create a file handler for writing, use the FileHandle(forWritingTo:) initializer. Next, iterate over all JournalEntry entities. During each iteration, you attempt to create a UTF8-encoded string using csv() on JournalEntry and data(using:allowLossyConversion:) on String. If it’s successful, you write the UTF8 string to disk using the file handler write() method. Finally, close the export file-writing file handler, since it’s no longer needed. Once the app has written all the data to disk, it shows an alert dialog with the exported file path. Note: This alert controller with the export path is fine for learning purposes, but for a real app, you’ll need to provide the user with a way to retrieve the exported CSV file, for example using UIActivityViewController. 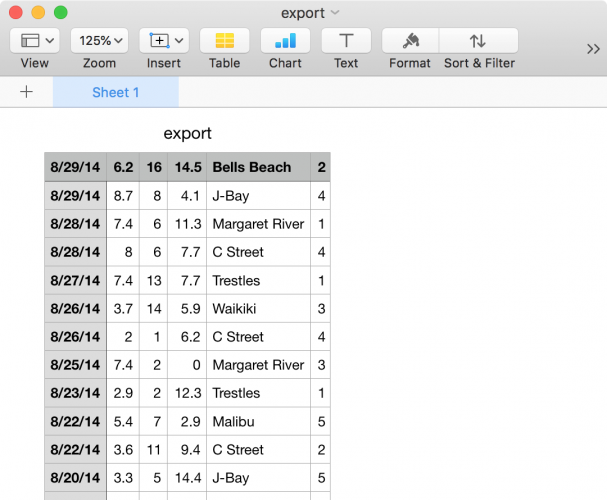 Now that you’ve seen how the app currently exports data, it’s time to make some improvements. You want the UI to continue working while the export is happening. To fix the UI problem, you’ll perform the export operation on a private background context instead of on the main context. As you saw earlier, this code retrieves all of the journal entries by calling fetch() on the managed object context. Instead of using the main managed object context also used by the UI, you’re now calling performBackgroundTask(_:) on the stack’s persistent store container. This creates a new managed object context and passes it into the closure. The context created by performBackgroundTask(_:) is on a private queue, which doesn’t block the main UI queue. The code in the closure is run on that private queue. You could also manually create a new temporary private context with a concurrency type of .privateQueueConcurrencyType instead of using performBackgroundTask(_:). Private Queue specifies the context that will be associated with a private dispatch queue instead of the main queue. This is the type of queue you just used to move the export operation off of the main queue so it would no longer interfere with the UI. Main Queue, the default type, specifies that the context will be associated with the main queue. This type is what the main context (coreDataStack.mainContext) uses. Any UI operation, such as creating the fetched results controller for the table view, must use a context of this type. Contexts and their managed objects must only be accessed from the correct queue. NSManagedObjectContext has perform(_:) and performAndWait(_:) to direct work to the correct queue. You can add the launch argument -com.apple.CoreData.ConcurrencyDebug 1 to your app’s scheme to catch mistakes in the debugger. You should always perform all operations related to the UI on the main queue, such as showing an alert view when the export operation is finished; otherwise, unpredictable things might happen. Use DispatchQueue.main.async to show the final alert view message on the main queue. Finally, add a closing curly brace to close the block you opened earlier in step 1 via the performBackgroundTask(_:) call. Now that you’ve moved the export operation to a new context with a private queue, build and run to see if it works! Tap the Export button in the top left, and immediately try to scroll the list of surf session journal entries. Notice anything different this time? The export operation still takes several seconds to complete, but the table view continues to scroll during this time. The export operation is no longer blocking the UI. Cowabunga, dude! Gnarly job making the UI more responsive. You’ve just witnessed how doing work on a private background queue can improve a user’s experience with your app. Now you’ll expand on the use of multiple contexts by examining a child context. Right now, SurfJournal uses the main context (coreDataStack.mainContext) when creating a new journal entry or viewing an existing one. There’s nothing wrong with this approach; the starter project works as-is. For journaling-style apps like this one, you can simplify the app architecture by thinking of edits or new entries as a set of changes, like a scratch pad. As the user edits the journal entry, you update the attributes of the managed object. Once the changes are complete, you either save them or throw them away, depending on what the user wants to do. You can think of child managed object contexts as temporary scratch pads that you can either discard completely, or save and send the changes to the parent context. But what is a child context, technically? All managed object contexts have a parent store from which you can retrieve and change data in the form of managed objects, such as the JournalEntry objects in this project. Typically, the parent store is a persistent store coordinator, which is the case for the main context provided by the CoreDataStack class. Alternatively, you can set the parent store for a given context to another managed object context, making it a child context. When you save a child context, the changes only go to the parent context. Changes to the parent context won’t be sent to the persistent store coordinator until the parent context is saved. Before you jump in and add a child context, you need to understand how the current viewing and editing operation works. There are two segues: SegueListToDetail and SegueListToDetailAdd. The first, shown in the previous code block, runs when the user taps on a row in the table view to view or edit a previous journal entry. Next, you get a reference to the JournalEntryViewController the user is going to end up seeing. It’s presented inside a navigation controller so there’s some unpacking to do. This code also verifies that there’s a selected index path in the table view. Next, you get the JournalEntry selected by the user, using the fetched results controller’s object(at:) method. Finally, you set all required variables on the JournalEntryViewController instance. The surfJournalEntry variable corresponds to the JournalEntry entity resolved in step 3. The context variable is the managed object context to be used for any operation; for now, it just uses the main context. The JournalListViewController sets itself as the delegate of the JournalEntryViewController so it can be informed when the user has completed the edit operation. SegueListToDetailAdd is similar to SegueListToDetail, except the app creates a new JournalEntry entity instead of retrieving an existing one. The app executes SegueListToDetailAdd when the user taps the plus (+) button on the top-right to create a new journal entry. The JournalEntryDelegate protocol is very short and consists of only one method: didFinish(viewController:didSave:). This method, which the protocol requires the delegate to implement, indicates if the user is done editing or viewing a journal entry and whether any changes should be saved. First, use a guard statement to check the didSave parameter. This will be true if the user taps the Save button instead of the Cancel button, so the app should save the user’s data. The guard statement also uses the hasChanges property to check if anything’s changed; if nothing has changed, there’s no need to waste time doing more work. Next, save the JournalEntryViewController context inside of a perform(_:) closure. The code sets this context to the main context; in this case it’s a bit redundant since there’s only one context, but this doesn’t change the behavior. Once you add a child context to the workflow later on, the JournalEntryViewController context will be different from the main context, making this code necessary. If the save fails, call fatalError to abort the app with the relevant error information. Next, save the main context via saveContext, defined in CoreDataStack.swift, persisting any edits to disk. Note: If a managed object context is of type MainQueueConcurrencyType, you don’t have to wrap code in perform(_:), but it doesn’t hurt to use it. If you don’t know what type the context will be, as is the case in didFinish(viewController:didSave:), it’s safest to use perform(_:) so it will work with both parent and child contexts. There’s a problem with the above implementation — have you spotted it? When the app adds a new journal entry, it creates a new object and adds it to the managed object context. If the user taps the Cancel button, the app won’t save the context, but the new object will still be present. If the user then adds and saves another entry, the canceled object will still be present! You won’t see it in the UI unless you’ve got the patience to scroll all the way to the end, but it will show up at the bottom of the CSV export. You could solve this problem by deleting the object when the user cancels the view controller. But what if the changes were complex, involved multiple objects, or required you to alter properties of an object as part of the editing workflow? Using a child context will help you manage these complex situations with ease. Now that you know how the app currently edits and creates JournalEntry entities, you’ll modify the implementation to use a child managed object context as a temporary scratch pad. First, you create a new managed object context named childContext with a .mainQueueConcurrencyType. 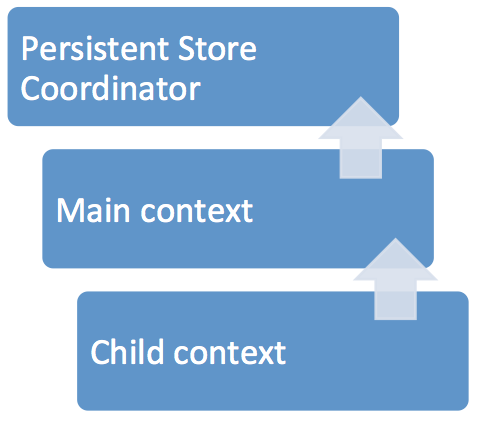 Here you set a parent context instead of a persistent store coordinator as you would normally do when creating a managed object context. Here, you set parent to mainContext of your CoreDataStack. Next, you retrieve the relevant journal entry using the child context’s object(with:) method. You must use object(with:) to retrieve the journal entry because managed objects are specific to the context that created them. However, objectID values are not specific to a single context, so you can use them when you need to access objects in multiple contexts. Finally, you set all required variables on the JournalEntryViewController instance. This time, you use childEntry and childContext instead of the original surfJournalEntry and surfJournalEntry.managedObjectContext. Note: You might be wondering why you need to pass both the managed object and the managed object context to the detailViewController, since managed objects already have a context variable. This is because managed objects only have a weak reference to the context. If you don’t pass the context, ARC will remove the context from memory (since nothing else is retaining it) and the app will not behave as you expect. Build and run your app; it should work exactly as before. In this case, no visible changes to the app are a good thing; the user can still tap on a row to view and edit a surf session journal entry. By using a child context as a container for the journal edits, you’ve reduced the complexity of your app’s architecture. With the edits on a separate context, canceling or saving managed object changes is trivial. Nice work, dude! You’re no longer a kook when it comes to multiple managed object contexts. Bodacious!